How can you prepare your career website for Google for Jobs? You might have already heard about a new Google search feature called Google for Jobs. This new tool was designed and developed for jobseekers and employers to help them find the right job offer or candidates more efficiently. Basically, it is a search engine dedicated to job listings. When a user searches for a job, displayed search results are going to be pulled from other career websites. For example, when someone searches for a query such as ‘web developer jobs in London’ Google is going to display a list of jobs with the option to preview and expand the job description. The main difference with the current search results is that a user can filter their results by location, title, date posted, etc. There is also no need to go on the website to see more details about the job. The results are going to be displayed at the top of the search results. Additionally, an excellent feature is the integration with Google Maps that will provide you with information such as how far away the job is from the current users’ location. Moreover, a user can also set up a job alert to be informed about new opportunities matching their criteria and apply for a job directly from Google for Jobs. What are the benefits for recruiters? Google for Jobs was created not only for people who are searching for the job but also to bring benefits for recruiters and career website owners. One of the advantages of having your job listed in the new search feature is that it will include your brand logo, reviews and job details that are easily visible for users. A job seeker will be able to narrow down their searches by different criteria to find more relevant job roles. For recruiters, it means that they will receive more relevant applicants for their job offers. Having jobs listed on Google for Job should also increase the number of clicks and conversions on your website so it’s worth getting your jobs listed there. How can you get your website ready for Google for Jobs? Google uses a machine learning artificial intelligence to get results for job search queries. To find the best matching job, it needs to understand the content of your recruitment website better. It’s no secret that Google is going to use structure data to recognise the type of content on your site. You will need to markup your jobs listing by applying a piece of code on your website using Job Posting structure data. Although it might look complicated at first, there are resources available online that will guide you through this process and explain how to apply microdata for Job Posting on your website. It will, however, require some of your web developer time to set it up for you. There is also another technical tweak that you should apply on your site to increase the chance of having your jobs listed on Google for Jobs, and that is adding a <lastmode> date in the sitemap for each of your jobs listed there. Although there are two main technical suggestions from Google to make your jobs visible, there might be other aspects that will have an impact, such as the size or speed of your website and other SEO ranking factors. Similarly to other Google updates, Google doesn’t want to give too much detail about components influencing job listings. 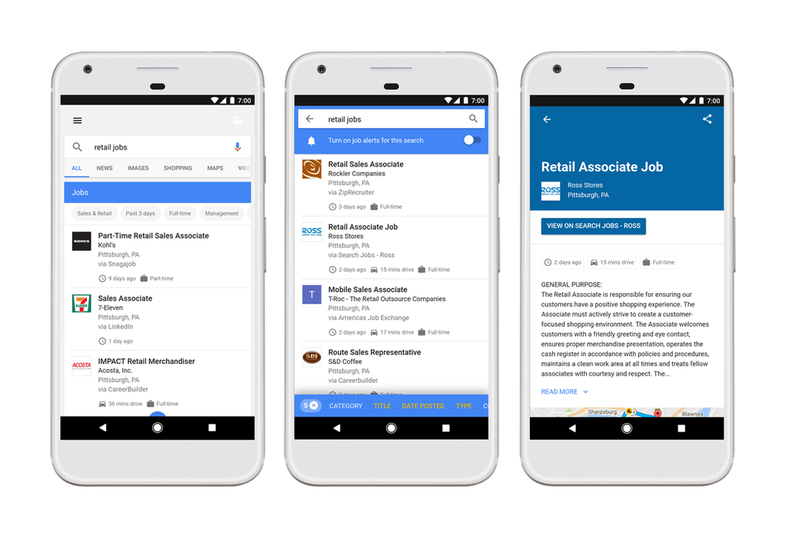 This new feature Google launched did so with a close partnership with job boards such as Monster, LinkedIn, Facebook and Glassdoor. So if your jobs are posted on these websites there can be a higher chance your job will be listed on Google for Jobs. On the other hand, however, Google claims that all career websites which update their sitemaps with job posting microdata are going to have their job listed automatically as well. Our recommendation would be to apply both, have your jobs posted on job boards and optimise your recruitment website for this new search feature. Google also announced that its new artificial intelligence can recognise duplicated jobs and display only one to candidates that should reduce the risk of receiving duplicated applications. Currently, Google for Jobs is only available in the USA and the date of releasing it in the UK is still not confirmed but we expect it to happen in 2018.